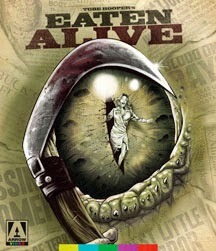 Arrow Video USA recently send us information that they will be releasing Tobe Hooper's Cult Classic "Eaten Alive". The film stars Robert Englund, Marilyn Burns, William Finley and Mel Ferrer. Special features on the special edition includes Brand new 2K transfer from the original camera negative, High Definition Blu-ray (1080p) and Standard Definition DVD presentations, Optional English SDH subtitles for the deaf and hard of hearing, Audio commentary with co-writer and producer Mardi Rustam, make-up artist Craig Reardon and stars Roberta Collins, William Finley and Kyle Richards, New introduction to the film by director Tobe Hooper, Brand new interview with Hooper, My Name is Buck: Star Robert Englund discusses his acting career, The Butcher of Elmendorf: The Legend of Joe Ball - The story of the South Texas bar owner on whom Eaten Alive is loosely based, 5ive Minutes with Marilyn Burns - The star of The Texas Chain Saw Massacre talks about working on Eaten Alive, The Gator Creator: archival interview with Hooper, Original theatrical trailers for the film under its various titles Eaten Alive, Death Trap, Starlight Slaughter and Horror Hotel, US TV and Radio Spots, Alternate credits sequence, Reversible sleeve featuring original and newly commissioned artwork by Gary Pullin, Collector's booklet featuring new writing on the film, illustrated with original archive stills and posters and more. Tobe Hooper's "Eaten Alive" hits retail on July 28th. Nearly a decade before he donned Freddy Kruger's famous red and green sweater, horror icon Robert Englund delivered a supremely sleazy performance in Eaten Alive - another essay in taut Southern terror from Tobe Hooper, director of The Texas Chain Saw Massacre. Oozing atmosphere from its every pore (the entire film was shot on a sound-stage at the famous Raleigh Studios, which lends it a queasy, claustrophobic feel) Eaten Alive matches The Texas Chain Saw Massacre for sheer insanity - and even draughts in Chain Saw star Marilyn Burns as the terrorised woman-in-peril, alongside William Finley and Mel Ferrer.